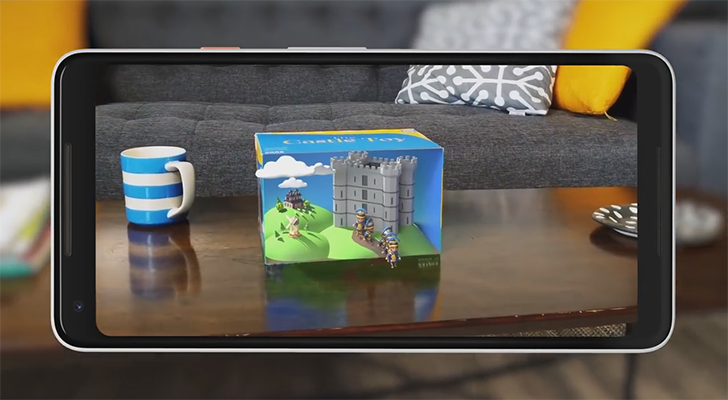 Easily the most interesting part of the new ARCore 1.2 is something called Cloud Anchors, which empowers developers to build apps that let users share an AR space. Remember that cool Just a Line AR doodling tool we saw debut a couple months back? Thanks to Cloud Anchors, you'll soon be able to work with a friend on a shared doodle — the multi-user collaborative experience will even cross platform boundaries, letting iOS and Android users work (and play) together. Augmented Images is arriving to let developers seamlessly transform real-world objects into AR-enhanced rich content. And ARCore 1.2 can also now let apps take advantage of Vertical Plane Detection to stick AR elements to a greater variety of surfaces than ever before — this one sounds like a real boon for the growing family of virtual-furniture-showroom apps. Other changes are a bit more behind-the-scenes (as if this weren't all focused on developers already), like Sceneform, a system for implementing AR without requiring knowledge about 3D graphics and OpenGL. Users won't see anything different, but the lower bar of entry may encourage more creators to get involved with augmented reality. We're more excited about some of these changes than others, but look forward to seeing how devs start taking advantage of all of them within their ARCore-powered apps in the days and weeks to come. ARCore 1.2 is available now in the Play Store for (the all-too-short but nonetheless growing list of) supported devices, or you can snag it from APK Mirror and manually install it yourself.